Let me begin by saying that once you own the Royal Enfield Himalayan, you will never ever complain about how the tax payers money is being used and how no one bothers about providing us with paved roads. The motorcycle in flesh invites you to go places that may or may not have paved roads. …..back to the regular auto journo jargon. Royal Enfield finally revealed the ‘Himalayan’ earlier today and it sure was a visual treat. We at TQ can’t wait to get our hands on one, to provide you with a full ride review. We have long been subjected to spy pics of this motorcycle and finally when it came rolling down a steep incline (what a way to introduce a motorcycle – watch the video HERE), it took everyone’s breath away (ours atleast). The looks will not appeal to everyone but that’s not what Royal Enfield is aiming for here. They have given us a product that promises to take us wherever we want to go, roads or no roads. You probably could take a lot of motorcycles anywhere but this one is purpose built and just makes sense. The specifications were handed out long before the media launch had started, a good move that had everybody focused on what Siddhartha Lal (CEO Royal Enfield) and Rudratej Singh (President Royal Enfield) had to say about their honest offering. To sum up its specifications, the Himalayan is a 411cc single cylinder, air cooled, 4 stroke, single overhead cam engine that churns out 24.5 bhp of power. A 5 speed transmission will drive you through the gears, while a carburetor will make sure you don’t have to worry about your fuel injection unit packing up in the remotest of places. ABS is not an option at the moment but with government cracking down hard, we may see a future version on it. Shorter people will find the ride height confidence inspiring. With the seat height at 800mm, someone at 5’6” will be able to firmly place their feet on the ground. With more than a million sq km to cover, the Himalayas are calling out to every adventure seeking, soul searching individual and the only way to explore them is astride the ‘Himalayan’. There are other offerings in the market but quite frankly, unless you have deep pockets, they are quite out of reach for most of us. I think what Royal Enfield have done here, is provided everyone with an opportunity to go explore…….explore the hills, the forests, through streams, get lost somewhere without obviously emptying your account and not worrying about getting stuck in the wilderness and by that I mean that this motorcycle can be push started and the headlight will function with a dead battery. I’ll take one thank you! For an honest bike, there is truly a lot of thought gone into developing this motorcycle. While trail/ adventure riding, it helps if you don’t have to be watchful about damaging your alloy wheels, this comes with spokes. You don’t have to worry about your fuel injector packing up which cannot be repaired. The Himalayan is carbureted, separating the men from the boys who truly want to get down to fix things. Traditionally we have never been a DIY nation but when it comes to motorcycles we seem to love to repair and tinker with our own. The fit and finish of the motorcycle is fairly good with minimal vibration travelling through your hands when revved at standstill. We will have to wait for a first ride to truly experience it. One of the bikes at the launch was accessorized with panniers. Fit and finish of the accessories seemed decent and we hope these will stay on and take a beating given that most of our travelling routes are potholed filled. Unfortunately, we will have to wait for an official announcement on the price, which will be made mid March 2016 and that’s when Royal Enfield plan to officially start production and take orders. We think the Himalayan will be priced around the 1.8 lakh mark (ex showroom Delhi) atleast we are hoping that it comes in that price point or lower. 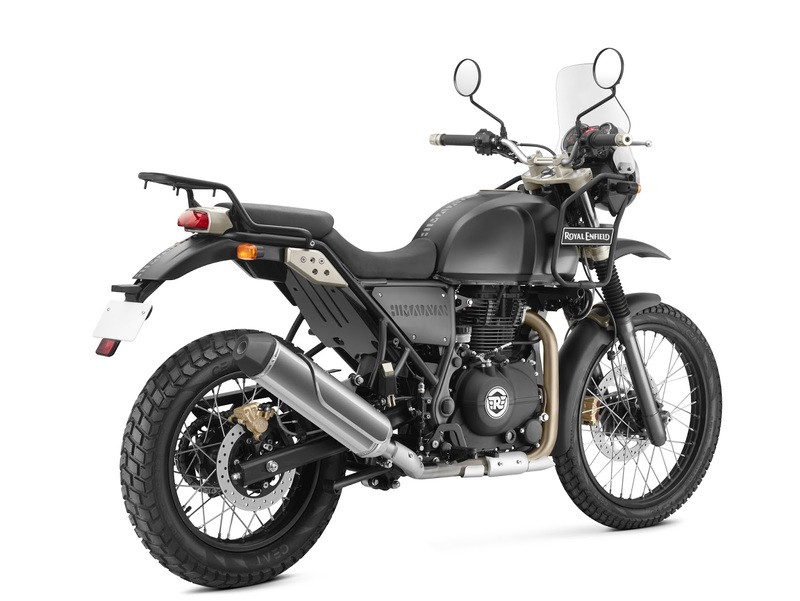 Congratulations to Royal Enfield on launching the Himalayan. We are excited and you certainly should be.